The global nuclear sector has been through something of an apocalyptic patch since the disaster at Fukushima – from power station shutdowns in Japan and Germany to waste-plan chaos in the UK to doubts about China’s ability to showcase new reactor designs. But not everything is grinding to a halt. Research into nuclear fusion, as opposed to the atom-splitting fission technology which powers our conventional nuclear power stations, maintains momentum. While sceptics joke that a breakthrough for the long-awaited miracle technology is always 30 years away, advocates argue we are inching closer to a clean and almost boundless energy source. Fusion essentially creates the sun’s reactions on earth, using temperatures of 200 million degrees Celsius to get atoms derived from seawater to fuse together, releasing huge amounts of energy in the process. Britain, currently home to the only machine in the world that can actually do this (though it doesn’t produce electricity), is stepping up collaboration with one partner in particular: China. Steven Cowley, director of the Culham Centre for Fusion Energy and chief executive of the UK Atomic Energy Authority, is Britain’s leading fusion scientist. He recently completed a tour of China, visiting Chengdu and Hefei – the country’s two centres of nuclear fusion research – and holding talks with Chinese counterparts about building a closer partnership. Possible moves include bringing Chinese scientists to work on fusion experiments in the UK. Cowley even looks forward to a future with “Anglo-Chinese fusion reactors”. Cosying up to China could prove a deft move. From the US to South Korea, countries around the world are investing in fusion, but China in particular is throwing resources at the problem. Every year, it brings hundreds of new PhD students into the ranks of fusion scientists, and is seen as the best bet to house the world’s first electricity-producing reactor. Conventional nuclear power is limited by the fact the world’s uranium stocks may run out in a couple of hundred years. Fusion on the other hand gets its fuels, deuterium and lithium, from seawater – not only in plentiful supply but easily accessed, a definite bonus for an increasingly energy-insecure China. Moreover, fusion produces no significant waste. Against the background of a global struggle to dispose of toxic waste piles, this is a weighty advantage. “For an economy the size of China’s, especially the size it will be in three decades, fusion is really the only thing I think you can slip in without producing a long-term legacy of what you’ve done, whether that’s massive CO2 build up, or a lot of nuclear waste to store,” says Cowley. Today, the world has only one operational fusion experiment capable of producing fusion energy: the Joint European Torus, or JET, in England. That won’t be the case for long. 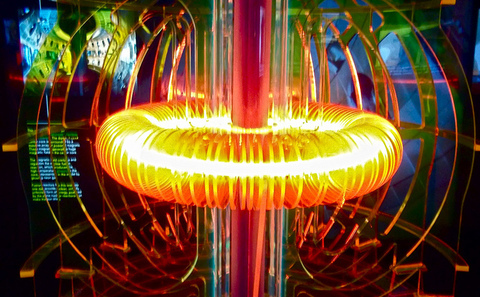 A multinational effort to build a demonstration fusion reactor in the south of France, the ITER project – though currently a US$19 billion hole in the ground – is expected to start experiments in the mid 2020s. Its backers hope it will be the first fusion experiment to produce more power than it consumes. In the longer term, the focus is likely to move eastward. China and South Korea, both partners in ITER, have plans to press ahead with their own demonstration projects immediately after completing the European scheme. Having footed the lion’s share of the bill for ITER – 45% of the cost as against China’s 9% – Europe could find itself left behind. But does it matter who succeeds first? Such hopes and fears rest on the assumption that fusion will actually happen at scale. This is far from certain. The question is not whether creating fusion reactions on earth is possible (that’s been clear since JET produced the equivalent of 16 windmills’ worth of power in 1997) but whether the reactions can be sustained, produce more energy than they consume, and at low enough prices to compete with other power sources. Other critical questions remain unanswered – like what material reactor walls should be made out of so they don’t have to be replaced every couple of years. Progress is complicated by the international nature of the endeavour. At ITER, the need to accommodate the wishes of six countries plus the European Union has created inefficiencies. The vacuum vessel, a component of the reactor, is being part built in Korea, part built in Europe, for instance, because both want a role in production. Delays and lengthy design reviews have seen the estimated cost of the project triple since 2006 and the timetable slip by four years. Many argue the world would be better off ploughing the funds into alternatives. China is of course exploring other avenues, including Pebble Bed Module Reactors, another nuclear technology long hailed as the perfect energy source, and thorium – an effort being led by the son of former president Jiang Zemin with a start-up budget of US$350 million and 140 researchers. Outside of the nuclear sphere, shale gas has the potential to transform the domestic energy market. Pulsotron-2 reached ignition conditions in October 2013, the Pulsotron 300k which cost is less than 4.4M$ is designed to try full ignition in 2 years. The power is 700kw (the power of a truck). It would solve contamination and energy problems in China in the short term. The project is at the Researchgate furum.